We are manufacturer & supplier of a wide range of Indian Designer Bag that is available in variety of patterns, colors and designs. 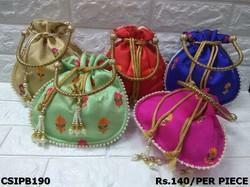 Row Silk Multicolor Fancy Potli Bag, Size: 7"
Fine Decorative Cloth Purse Available In Different Designs & Sizes. This straw bag is super comfortable and resistant, perfect for the, summer evenings, holidays, parties, take it anywhere you want and look original!